Tim Lucas / Video WatchBlog: It's the 12th Annual Rondo Award Nominations! 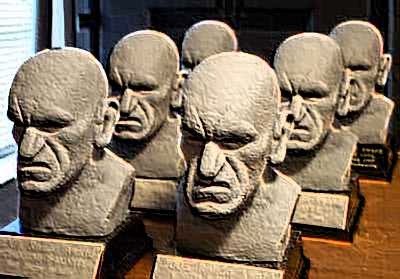 It's the 12th Annual Rondo Award Nominations! The 12th Annual Rondo Award nominations have been posted and, to my surprise and great pleasure, VIDEO WATCHDOG and I are once again among the nominees - me with five nominations of my own, and VIDEO WATCHDOG with six! Best Cover (Charlie Largent's BLACK SUNDAY cover for VIDEO WATCHDOG 173). Mind you, I - as well as a good many other worthies - are also eligible for two write-in categories: Best Writer and Best Reviewer. Congratulations to Bill, Ramsey, Doug and Charlie on our team, but also to ALL the nominees and their worthy products and projects! Donna and I would certainly appreciate your votes, but most importantly, just get involved and make the results better informed with your participation! Voting ends at 12:00am midnight, May 5!